The Zambian Minister of Agriculture and Livestock, Hon. 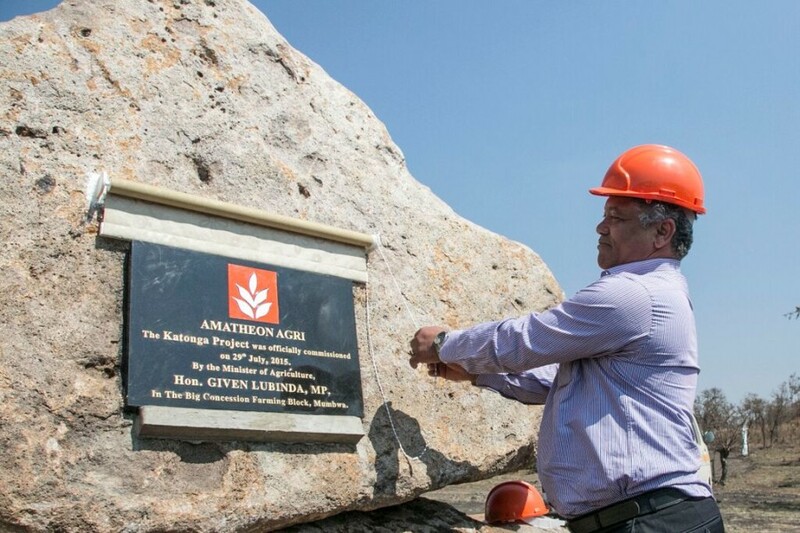 Given Lubinda, visited Amatheon Agri Zambia’s operations in Mumbwa District on the 29th of July. He was accompanied by the Minister of Commerce, Trade and Industry, Hon. Margaret Mwanakatwe. The Minister of Agriculture officially inaugurated the constructional phase of two different dam sites which are part of Amatheon’s expansion strategy in the area. The CEO of the Amatheon Group, Carl Heinrich Bruhn, and the Managing Director of Amatheon Agri Zambia, Troy Minne, were honored to show the delegation around two evolving farm blocks which are going to be irrigated by the two separate dams. The company intends to invest around $20 million for the expansion of both farm blocks including land development and irrigation. Amatheon Agri Zambia has been operating in Mumbwa District since the beginning of 2012. The company’s activities contributed to agricultural growth and social infrastructure in the area. Apart from an improved infrastructure and employment on the farm, this has also been achieved through Amatheon’s successful implementation of an Outgrower Scheme whereby smallholders are provided with training and access to the agricultural market.